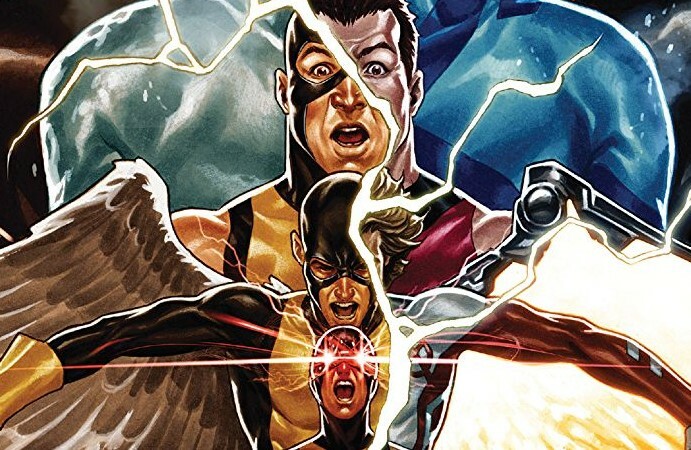 The saga of the time-displaced Original Five (or O5, as they’ve come to be known) X-Men has gone on for a long time. Too long, some might say. Brought forward by a rather bitter Beast to show them the error of their future ways, the O5 always knew it was always going to end messy. Now it’s time to set it right. The time to clean house has come. From the first page of Extermination, the stakes are set. The opening scene gives us a glimpse of a destroyed Xavier Institute for Mutant Education and Outreach in Central Park, dead X-Men scattered at the feet of a mysterious hooded figure. The scene is familiar: an apocalyptic future. Yet these staple X-Men tropes don’t feel as rehashed as they otherwise might if the focus wasn’t squarely on the O5. We’ve known the consequences of removing them from the original timeline were coming, we just didn’t know when. 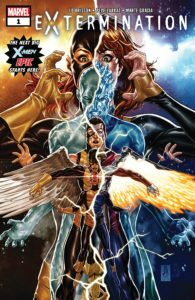 Ed Brisson sets the stakes high in this first issue and gives the X-Men (especially Rachel Grey) some needed emotional beats and some quiet moments before the action kicks off. There are two deaths, one more unfortunate than the other for how it harkens back to ugly tropes that are better left in the past. Both feel like they hold some weight, even we if we all should know better than to trust deaths that happen in the first issue of a five-issue event. The only disappointment here is that the mystery hooded figure gets revealed at the end of the issue. I was expecting a lingering question, one that would drag us along for the ride. The reveal was surprising either way, and gets more interesting the longer you think about the lasting ramifications of the O5 having missed rather large chunks of their past lives, leaving wrecked—if not drastically changed—continuity in their wake. Ed Brisson’s thought about this. You should be thinking about it, too. One of the best parts of Extermination #1 is the impact that it has on a second read-through and even a third. Along for the ride with Brission is Pepe Larraz, whose art I’ve loved since Deadpool vs. X-Force. His strong character work, bold lines and expressions help push this story beyond its familiar trappings to something truly great. He sets the mood with the destroyed Xavier Institute and continues forward, each panel dripping with beautiful art. Not to be outdone, colorist Marte Garcia drapes Laraz’s art and all of the pages in a blanket of amazing colors. As much as Larraz’s illustrations catch your eye, the colors bring everything together and set the tone with the dark blue palette worked into almost every page. Should you read Extermination #1? In a single word: yes. You should read it once, and then again just to soak up all the wonderful art. The X-Men are known for being one of the most impenetrable family of comics out there, but this seems rather easy to walk into despite its outwardly tangled premise. I’m uncertain that this will be the next big X-Men epic at this point, but that’s mostly my even burnout talking. Whatever happens next, Brission promises us that we’re in for one hell of a ride.